There's no telling how old this recipe is—it could conceivably date back to the Roman Empire, when the Roman-Jewish community numbered about 50,000. They are mentioned in cookbooks dating back to the 16th century. 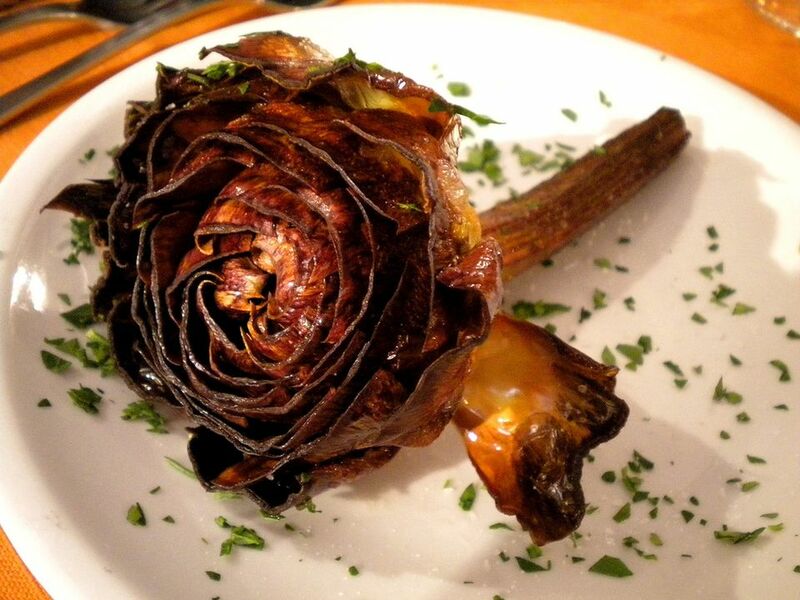 In any case, carciofi alla giudia (Jewish-style artichokes) are a wonderful treat: whole fried vegetables that look like golden sunflowers, with a delicious, nutty crunchiness. In Italy, the artichokes used for this dish are typically the giant round ones called mammole or cimaroli. They're particularly large and tender, with densely clustered, rounded petals that don't have pointed tips with prickly spines. That's important since the entire artichoke is used in this dish. That being said, if you can't find that variety, you can use any large artichoke, being careful to strip away tough outer petals and trim away all prickly spines at the tips before cooking. Starting with one artichoke, begin trimming the leaves away from the base, removing the darker tough exterior and leaving the more tender inner portion. As you work your way up the artichoke, you'll have to trim away progressively less of each ring of leaves. When you reach a little past the halfway point of the artichoke, where the leaves begin to slope in, make a horizontal cut to remove the top quarter or so of the artichoke. Next, cut into the top of the artichoke, keeping your knife almost vertical, to remove any spines there may be in the smaller leaves towards the heart of the flower. Next, trim away the tip of the stem, which will likely be black—you will see a ring in the middle of the cut surface. The outer layer of an artichoke stem, beyond the ring, is tough and fibrous. What is inside, however, is an extension of the heart: both tender and tasty. Carefully peel or cut away the fibrous outer layer, rub the artichoke with a cut, partially squeezed lemon to keep it from blackening, put it in a bowl of water with the juice of a lemon, and then trim the next artichoke. Continue until you have prepared all your artichokes. Come time to cook your artichokes, heat 3 inches (8 cm) of olive oil, or an oil with a high smoke point if you prefer, in a fairly deep, fairly broad pot (one large enough to contain the artichokes flat, and the oil should almost cover them). While it is heating, stand your artichokes on absorbent paper to drain, and prepare a bowl with fine sea salt and pepper. Season the artichokes inside and out with salt and pepper and shake off the excess. Slip your artichokes into the hot oil and cook them for about 10 minutes, turning them in the oil so they cook evenly. Remove them to a plate lined with absorbent paper—at this point, they're partially cooked, and you could, if you want, resume cooking them later. Assuming you want to enjoy them now, however, reheat your oil—it should be hotter now, because this is the frying stage—before they were simply being cooked in the hot oil and slip the first artichoke in, initially horizontally. Fry the artichoke for 3 to 4 minutes, until the stem is browned and then use a pair of long-handled implements, such as BBQ forks or a pair of metal kitchen tongs, to upend the artichoke—it should be stem-up with its top on the bottom of the pot. Press down gently; the leaves will brown thanks to the heat of the bottom of the pan, and the artichoke will open like a flower. While the artichoke is browning, line a second plate with absorbent paper. Put the first artichoke to drain blossom down, and continue with the next. Continue until you have finished frying your artichokes. Serve immediately, with optional lemon wedges for squeezing.